A Special commemorative paving stone has been laid in Southport to recognise war hero Private Richard George Masters VC. The laying of the commemorative stone is the latest of five permanent tributes to former residents across Sefton who received the Victoria Cross during the First World War. 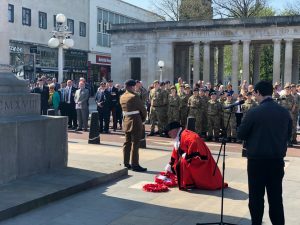 Members of Private Masters’ family joined the Lord Lieutenant of Merseyside and Mayor of Sefton, Cllr Dave Robinson, to unveil the VC Commemorative Flagstone as part of special service held at the War Memorial, Lord Street, Southport on Saturday April 21. Prior to the service, 238 Sefton Squadron RLC paraded from Nevill Street to the Monument in tribute to him. Mayor of Sefton, Cllr Dave Robinson, said: “It was an honour and a privilege to pay tribute to a true Sefton hero. “Private Masters did what nobody else thought ever possible and his actions on the battlefields of France saved hundreds of lives in just a day. 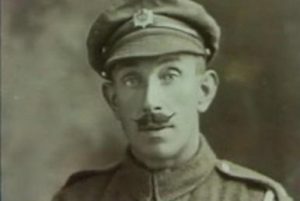 Private Richard George Masters was a 41-year-old Ambulance driver stationed near Bethune, France in 1918 when an enemy attack left his fellow soldiers cut off and facing certain death. Although thought impassable, Private Masters single-handedly drove his ambulance across the battlefield, through a barrage of heavy fire and bombing, in a bid to rescue the wounded. He made journey after journey throughout the afternoon. When the gunfire stopped and the dust settled, Private Masters had rescued nearly 200 men. His heroics did not go unnoticed and Private Masters was awarded the Victoria Cross, the highest and most prestigious award for gallantry in the face of the enemy that can be awarded to British and Commonwealth forces.